LaSalle Police are investigating a theft of gas from a LaSalle gas station involving a stolen vehicle. Police say that on Tuesday, March 19th, 2019, a suspect attended a local gas station and pumped about $20 worth of gas then left without paying. A check of the suspect vehicle revealed that it had been previously reported stolen a few days earlier to Windsor Police. The surveillance video depicts the suspect as a white male in their early 20’s and average height (5’8″), with a slim build and wearing a dark camo jacket with a hood, black Adidas shoes, black track pants, bright blue snap back baseball hat with white lettering on the front. 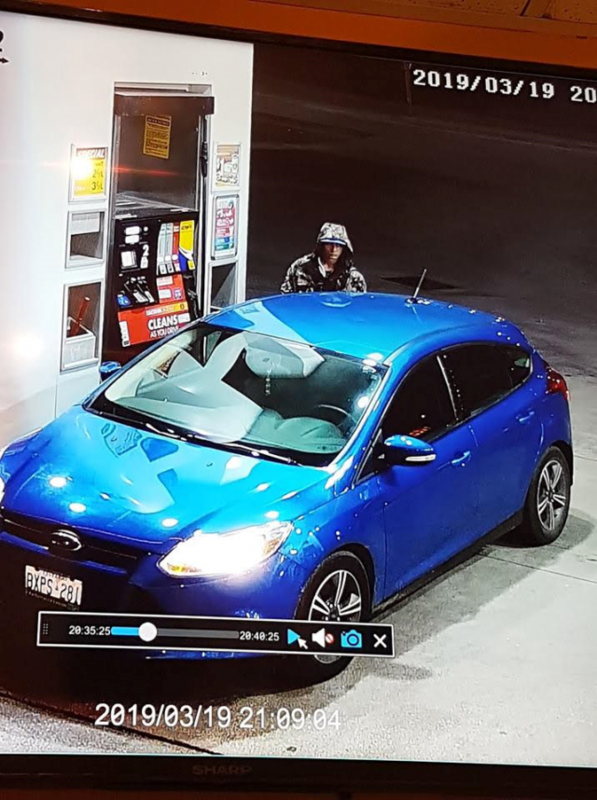 The vehicle is a 2014 Ford Focus, 4 door hatchback, blue in colour with Ontario licence BXPS281. If you can identify the person or have information relating to this incident, you are asked to contact LaSalle Police at 519-969-5210 referencing Occurrence #19-2274 or you can contact Crime Stoppers at 519 258-8477 or online at www.catchcrooks.com.